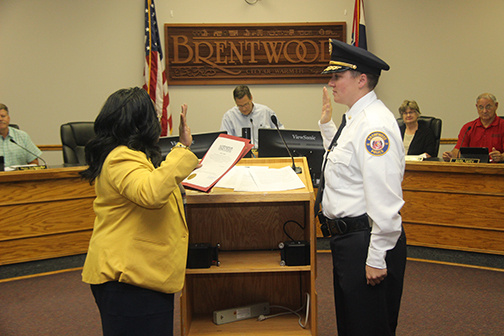 Major Angela Hawkins, Class of 2003 - Hawkins was sworn into the Brentwood Police Department during the city's Aug. 20 board of alderman meeting and is now serving as assistant chief for the department. Her official job title is bureau of community policing commander. 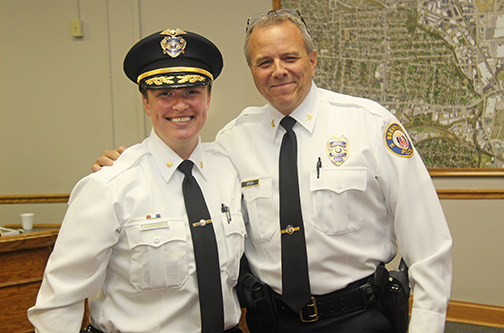 Hawkins served as a St. Louis police officer and detective for 13 years and received several department awards including the Distinguished Service Citation and the Missouri Medal of Valor award. She also served two years as a detective on the Major Case Squad of Greater St. Louis. Hawkins earned bachelor's and master’s degrees in criminal justice/law enforcement administration from Lindenwood University. Her law enforcement expertise is in supervision of investigative and patrol operations and initiatives. Above, Hawkins is sworn into her new position. Below, Hawkins is shown with Brentwood Police Chief Joseph Spiess Jr.